The life-cycle of a repository instance typically starts with the initial loading of datasets, followed by the processing of queries and updates. The loading of a large dataset can take a long time - up to 12 hours for a billion statements with inference. Therefore, during loading, it is often helpful to use a different configuration than the one for a normal operation. Furthermore, if you frequently load a certain dataset, since it gradually changes over time, the loading configuration can evolve as you become more familiar with the GraphDB behaviour towards this dataset. Many dataset properties only become apparent after the initial load (such as the number of unique entities) and this information can be used to optimise the loading step for the next round or to improve the configuration for a normal operation. Configure a repository for best loading performance with many estimated parameters. The size of the data structures used to index entities is directly related to the number of unique entities in the loaded dataset. These data structures are always kept in memory. In order to get an upper bound on the number of unique entities loaded and to find the actual amount of RAM used to index them, it is useful to know the contents of the storage folder. The total amount of memory needed to index entities is equal to the sum of the sizes of the files entities.index and entities.hash. This value can be used to determine how much memory is used and therefore how to divide the remaining memory between the cache-memory, etc. The file entities.index is used to look up entries in the file entities.hash and its size is equal to the value of the entity-index-size parameter multiplied by 4. Therefore, the entity-index-size parameter has less to do with efficient use of memory and more with the performance of entity indexing and lookup. The larger this value, the less collisions occur in the entities.hash table. A reasonable size for this parameter is at least half the number of unique entities. However, the size of this data structure is never changed once the repository is created, so this knowledge can only be used to adjust this value for the next clean load of the dataset with a new (empty) repository. Set to a large enough value. Can speed up queries (and loading). To provide better performance when executing queries that use contexts. Whether to keep the properties of each literal in-memory. Furthermore, the inference semantics can be adjusted by choosing a different ruleset. However, this will require a reload of the whole repository, otherwise some inferences can remain when they should not. The optional indices can be built at a later time when the repository is used for query answering. You need to experiment using typical query patterns from the user environment. When executing queries or retrieving statements that use a wildcard in the predicate position, e.g., the statement pattern: dbpedia:Human ?predicate dbpedia:Land. To provide better performance when executing queries that use contexts, you can use the context index - CPSO. It is enabled by using the enable-context-index configuration parameter. Statistics are kept for the main index data structures and include information such as cache hits/misses, file reads/writes, etc. This information can be used to fine-tune GraphDB memory configuration and can be useful for ‘debugging’ certain situations, such as understanding why load performance changes over time or with particular data sets. CacheHits The number of operations completed without accessing the storage system. CacheMisses The number of operations completed, which needed to access the storage system. PageDiscards The number of times a non-dirty page’s memory was reused to read in another page. PageSwaps The number of times a page was written to the disk, so its memory could be used to load another page. Reads The total number of times an index was searched for a statement or a range of statements. Writes The total number of times a statement was added to a collection. resetCounters Resets all the counters for this index. Ideally, the system should be configured to keep the number of cache misses to a minimum. If the ratio of hits to misses is low, consider increasing the memory available to the index (if other factors permit this). Page swaps tend to occur much more often during large scale data loading. Page discards occur more frequently during query evaluation. GraphDB uses a number of query optimisation techniques by default. They can be disabled by using the enable-optimization configuration parameter set to false, however there is rarely any need to do this. 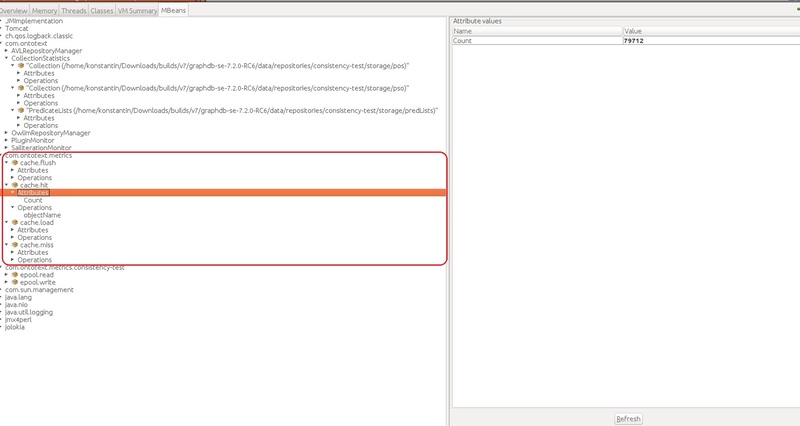 See GraphDB’s Explain Plan for a way to view query plans and applied optimisations. In this situation, the in-memory-literal-properties configuration parameters can be set to true, causing the data values with language tags to be cached. During query answering, all URIs from each equivalence class produced by the sameAs optimisation are enumerated. You can use the onto:disable-sameAs pseudo-graph (see Other special query behaviour) to significantly reduce these duplicate results (by returning a single representative from each equivalence class). The Expand results over equivalent URIs checkbox in the GraphDB Workbench SPARQL editor plays a similar role, but the meaning is reversed. If the query uses a filter over the textual representation of a URI, e.g., filter(strstarts(str(?x),"http://dbpedia.org/ontology")), this may skip some valid solutions as not all URIs within an equivalence class are matched against the filter.